Paula ChampagneGaining confidence is key to having fun. Do both at these 8 places to cross-country ski for beginners. Approachable and accessible, cross-country skiing is a great activity for outdoor enthusiasts of all levels. Still, if you’ve never strapped on a pair of cross-country (also called “Nordic”) skis, figuring out where to start can be daunting. For first-timers who may need some extra guidance, begin here, with our list of destinations that cater to total newbies. AMC’s newest Maine lodge lets you ski deep in the heart of the wonderfully secluded 100-Mile Wilderness, without needing pro skills. Rebuilt from the ground up and reopened in 2018, Medawisla offers staff-guided cross-country outings perfect for beginners, with basic instruction and on-the-snow exercises to help build your confidence. (For more advanced destination baggers, the same staff leads lodge-to-lodge ski treks.) Medawisla also has cozy accommodations and hearty meals for when you’re ready to call your first try a success. Bonus: Flat-as-a-pancake Second Roach Pond provides a huge expanse with no hills for those getting their feet under them. You’ll need to reserve and pick up your gear from Northwoods Outfitters in Greenville, but once you arrive, AMC shuttles cumbersome equipment between the three Maine lodges. A half-hour drive from Portland, family-owned Harris Farm displays some of New England’s most idyllic pastoral scenery. Beginners who shy away from larger facilities may love the approachability of this charming location. In addition to 25 miles of maintained trails, meticulously groomed and carefully marked, the fully functioning farm offers one-hour group lessons for $18 and private lessons for $30. When you’re ready to test your skills on the trails, feel free to bring along a furry friend for moral support; dogs are allowed Monday through Friday. Reward yourself afterward with cocoa and farm-fresh milk in the seasonal ski hut. 3. GREAT GLEN TRAILS OUTDOOR CENTER | Gorham, N.H. Located in the shadow of majestic Mount Washington, Great Glen features gorgeous views of the Presidential Range, but first-time skiers may be even more taken by the beginner-friendly amenities. No skis or poles? Rent gear at the Base Lodge. Looking for a lesson? Choose from an array of classes, from a short intro course to “Ski with an Olympian,” led by 1984 competitor Sue Wemyss. Less challenging trails vary in distance; timid first-timers can try out the mile-long Bellows Loop before tackling some of the longer novice paths. No matter your level, knowledgeable staff will update you on trail conditions and help plan your route for the day. Be sure to check the center’s website for deals on lessons and rentals. 4. SMUGGLERS’ NOTCH NORDIC SKI & SNOWSHOE ADVENTURE CENTER | Jeffersonville, Vt.
First-timers to this nature-scale playground for winter sports can sign up for an hourlong private lesson or learn as a family in the Mom or Dad & Me classes. (The center also offers several age-specific play areas, including a childcare center, a kids’ club, and a teen room.) More established skiers can check out the special programs, including moonlit skis and guided backcountry tours. Those who prefer to design their own route have 20 miles of groomed trails at their ski tips, from the 10-mile perimeter trail to a half-mile loop off the trailhead parking lot. 5. WESTON SKI TRACK | Weston, Mass. Weston Ski Track’s unique urban setting shows skiers a whole new side of the Charles River. Experience more than 9 miles of riverside ski trails just 20 minutes from downtown Boston, including a smaller section with snowmaking machines to guarantee you’ll have snow to practice on. The center offers rentals and a variety of both skate and tour ski lessons for all ages and abilities. For first-timers, staff suggests the center’s Beginner Classical Series, which meets for two two-hour sessions. Depending on the day, the center will shift class frequency to meet visitor needs. Check out their website’s ski report for a full list of walk-in classes. 6. WINDING TRAILS | Farmington, Conn.
Run by a nonprofit community group, Winding Trails offers a friendly, encouraging environment for first-time skiers. Stop by the center’s Garmany Hall to sign the trail register, rent gear, or pick up snacks. You can also sign up for group lessons, private lessons, or a learn-to-ski package before hitting the facility’s 12-mile network of groomed trails. No-longer-brand-newbies who are ready to go it alone might start with the green loop, a 1.7-mile path that meanders through towering pine trees and beside still winter ponds. 7. MOUNTAIN TRAILS CROSS-COUNTRY SKI CENTER | Tannersville, N.Y.
Nestled in the Catskill Mountains, two hours from New York City, Mountain Trails could be the perfect getaway for cross-country-curious city dwellers. The 20-mile trail network—more than half of which is designed for beginners—passes through thick hemlock forests and winter wonderland meadows. Start at the base lodge to purchase trail passes, rent equipment, and register for an introductory lesson. 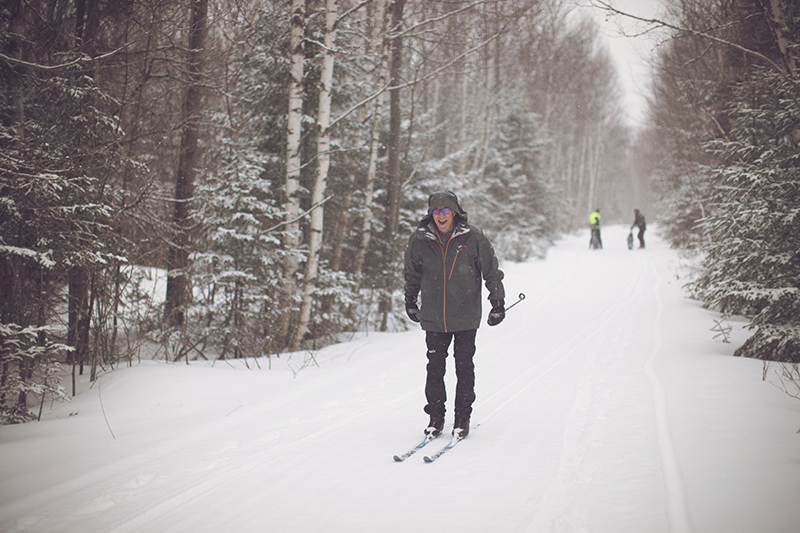 Just outside the lodge, Blue Spruce Trail marks the start of a newbie-friendly ski, monitored during operating hours by the National Ski Patrol. 8. WHITE GRASS TOURING AND CAFE | Davis, W.Va.
Beginning skiers at White Grass experience magical woodlands and outstanding panoramic views in one of the country’s oldest ski areas dedicated to cross-country. The center offers rentals and lessons, including a $6 mini tutorial that promises the basics in 15 minutes. Newbies can try several shorter trails before matriculating to a 3-mile loop through the western half of the property. Stop by one of the nine trailside shelters and grab dinner at the cafe after the skis come off. Be sure to pack an extra layer: A unique microclimate specific to Canaan Valley keeps White Grass 10 degrees cooler than the surrounding area. Get a kid-friendly primer on cross-country skills. Already have a few miles under your belt? Try five backcountry ski treks. Or plan a lodge-to-lodge ski trip in the Maine Woods. Emily Hughes is AMC Outdoors' fall 2018 editorial intern.